Tax credits reduce tax liability dollar-for-dollar, making them particularly valuable. Two valuable credits are especially for small businesses that offer certain employee benefits. Can you claim one — or both — of them on your 2015 return? Small employers (generally those with 100 or fewer employees) that create a retirement plan may be eligible for a $500 credit per year for three years. The credit is limited to 50% of qualified startup costs. The maximum credit is 50% of group health coverage premiums paid by the employer, provided it contributes at least 50% of the total premium or of a benchmark premium. For 2015, the full credit is available for employers with 10 or fewer full-time equivalent employees (FTEs) and average annual wages of $25,000 or less per employee. Partial credits are available on a sliding scale to businesses with fewer than 25 FTEs and average annual wages of less than $52,000. If you’re not sure whether you’re eligible for these credits, we can help. We can also advise you on what other tax credits you might be eligible for when you file your 2015 return. Contact us in Brea, 714.990.1040 or Visalia, 559.732.4135, or click the button below to schedule an appointment. The passing of the Protecting Americans from Tax Hikes Act of 2015 (PATH Act) makes various expired tax provisions permanent and extends other expired provisions for up to five years. This makes tax planning more important than ever. To save the most, you need to not only take advantage of every tax break you’re entitled but also be prepared to act quickly if tax legislation is signed into law. This is exactly what our Tax Planning Guide is designed to help you do. As you look through the guide, please note the strategies and tax law provisions that apply to your situation or that you would like to know more about. 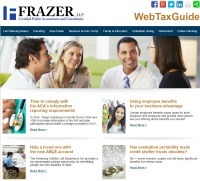 Then, call your Frazer LLP tax advisor with any questions you may have about these or other tax matters or click the button below.